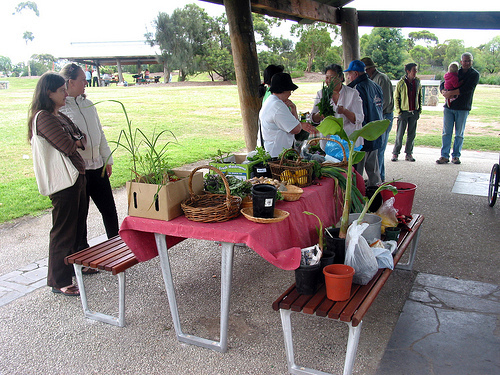 This morning, we went to a Fruits and Vegetables Swap Meet at Newport Lakes Park (Mason Street entrance), organized by Transition Hobsons Bay, a community group driving initiatives that promote more liveable neighbourhoods. 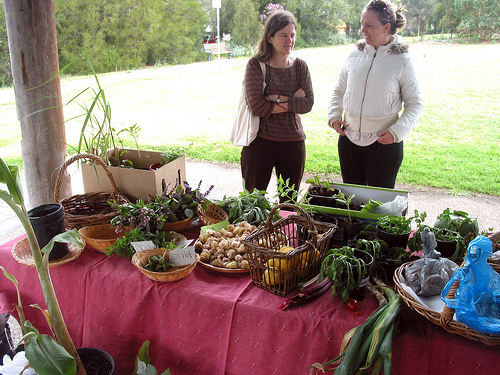 The swap meet takes place on the third Sunday of every month (10.30-11.30 a.m.) and there is a sister swap, Western Urban Harvest, on the first Saturday of every month (except Jan 2011 when it is on the 8th) from 10 to 11.30 a.m. at Pilgrim Street Park (Bristow Reserve) in Seddon. Everyone is welcome to participate. There are about 30 persons, several are from Altona and one person comes from as far as Maidstone. 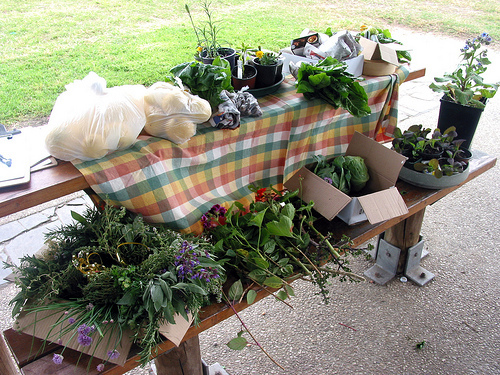 The two long tables at the barbeque shelter are packed with produce from backyard gardens. 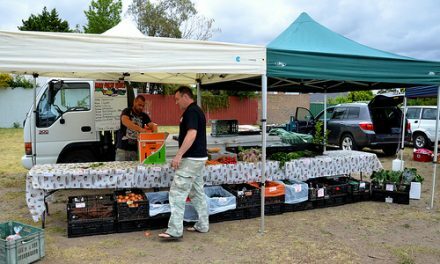 I am impressed by the large range of vegetables and fruits that are being shared around, some of which I have seen for the first time. My daughter kept asking my wife to break open the almonds for her to eat. 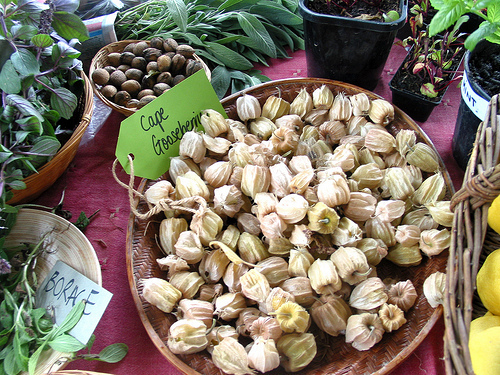 There are also Cape Gooseberries, shown in the photo below, which are small orange-yellow berries encased in a delicate, papery husk, which I have tried for the first time. My wife took a pot of dill (see photo below, left side), which she suspects is a spice used commonly in northern Chinese cooking. Indeed this is what she wanted, after we used Wikipedia to translate dill into the chinese equivalent term. 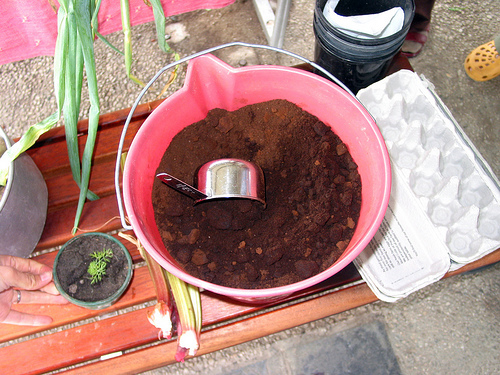 The brown stuff you see in the pot is not soil but Coffee Grounds. Instead of disposing ground coffee in landfills, this can be recycled as a very good fertilizer. The benefits are many, including soil loosening, water retention, reduction of soil-borne diseases and deterrent to snails, slugs, ants and cats. Shane Genziuk is an active advocate of recycling coffee grounds and has a comprehensive website called Coffee Grounds to Ground, solely on this topic. 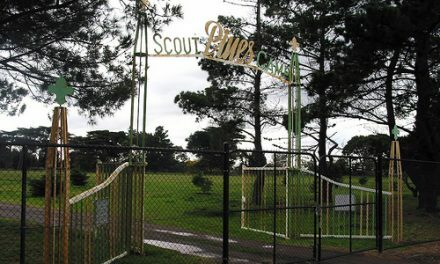 Jason, a founding member of Transition Hobsons Bay, told me that Shane is getting cafes to participate in a programme to display stickers indicating that their ground coffee are available for people who request them for recycling. Starbucks has an initiative known as “Grounds for your Garden” in which you can pick up 2 kg bags of ground coffee at the counter. 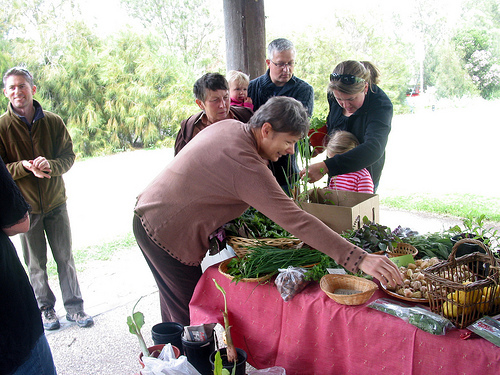 I will write more about the Transition Hobsons Bay group when I get more information from Jason and his wife, Kate. Wow! Great post. Thanks Anthony. Great article guys. Thank you for making of a mention of Ground to Ground and the information on the site. These kinds of initiatives empower us as individuals, and give us back a sense of control over how we interact with the environment and each other. Keep us the great work on the site, and thanks again.